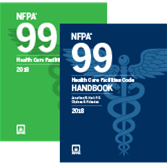 Confidently apply the latest risk-based requirements for health care facility safety with the 2018 edition NFPA 99 and Handbook Set. Do your best to protect health care facility patients, staff, equipment, and facilities using NFPA 99 and its unique Handbook as your guide. The 2018 edition of NFPA 99: Health Care Facilities Code follows a risk-based approach, where it is the risk posed to patients and staff, not the type of building, that defines safety guidelines. The companion Handbook provides answers, making this Set essential for everyone involved in health care safety including contractors, engineers, facility managers, AHJs, plumbers, gas and vacuum system installers, security personnel, insurance companies, and manufacturers. Work smarter and more efficiently to make sure facilities are safe. Save time, money, and lives with the 2018 edition NFPA 99 and Handbook Set. Understand and apply the latest risk-based requirements for health care facility safety with the 2015 NFPA 99 and Handbook Set. Be confident you're protecting patients, staff, equipment, and facilities using the field's most up-to-date resources. The 2015 edition of NFPA 99: Health Care Facilities Code builds on the risk-based approach introduced in the 2012 NFPA 99. The unique Handbook provides answers, making the Set essential for everyone involved in health care safety including contractors, engineers, facility managers, AHJs, plumbers, gas and vacuum system installers, security personnel, insurance companies, and manufacturers. Work smarter and more efficiently. Save time, money, and lives with the 2015 NFPA 99 and Handbook Set.